(Inside Science) -- Connoisseurs of pizza know that there's something special about a pizza cooked in a traditional wood-fired brick oven. But what is it that makes such a pie so much better than one cooked at home in a domestic oven? While sampling the local pizza in Rome, physicists Andreas Glatz and Andrey Varlamov asked themselves this very question. But they were not content to speculate -- being scientists, they decided to investigate it scientifically. “We used basic thermodynamic principles to describe the baking process in our work,” said Glatz, from Northern Illinois University in DeKalb. A pizza cooks simultaneously from above and below -- the dough via thermal conduction from the bottom of the oven and the toppings by thermal radiation from the air. For the perfect pizza, the cook must balance the two so that the dough and the toppings finish cooking at the same time. For that, they need to get the oven temperature right. The Roman pizzaiolos -- pizza bakers -- told Glatz and Varlamov that the optimal temperature for cooking in a brick oven was 330 degrees Celsius (625 F), much hotter than what can be achieved in a conventional oven. That high temperature, combined with the thermodynamic properties of the bricks themselves, is the secret to cooking the perfect pizza. 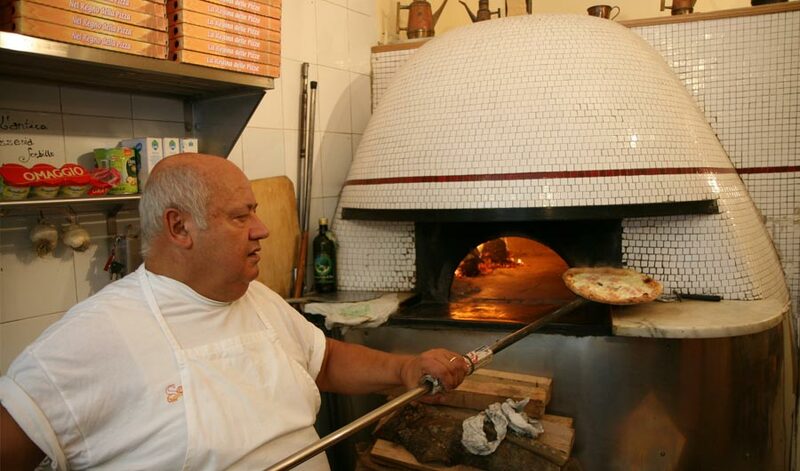 “The vaulted cavity of the brick oven together with the thick layer of bricks at the bottom of the oven guarantee an even heating of the pizza,” explained Glatz. Glatz calculated that at 330 C, the bricks on the bottom of the oven would reach about 208 C. His calculations, using the thermodynamic properties of dough and various toppings, showed this combination would cook both the dough and the toppings to perfection in about two minutes -- the same time given by the pizzaiolos. Since steel conducts heat better than brick, if a metal oven were heated to 330 C the bottom would reach 300 C and burn the dough. Lowering the oven temperature to a more realistic 230 C (446 F) would give a bottom temperature of 208 C, but then the thermal radiation wouldn't be high enough to fully cook the toppings. “So, you either get a pizza with overdone dough, if you bake the pizza longer than the two minutes to get the toppings cooked, or the toppings would be underdone and too watery,” said Glatz. Glatz and Varlamov, of the Institute of Superconductors, Oxides and Other Innovative Materials and Devices in Rome, published their findings in the journal Physics Education, as a way to help teachers explain some of the concepts of thermodynamics to their students. Matt Hartings, a chemist at American University in Washington, D.C., who teaches a course on the chemistry of cooking and is a keen pizza chef himself, said cooking can be an excellent way to teach scientific concepts. “There is lots of chemistry and physics involved in figuring out the perfect cooking environment,” he said. And though many people shy away from chemistry and think they can't do it, Hartings points out that they do it all the time while making supper. “The chemistry we do in kitchens is much more complex than anything I do in the lab,” he said. For his own pizzas, Hartings uses a baking steel which he preheats for about an hour under the broiler. “It's as good an approximation as you can get,” he said. Glatz has one final piece of advice for those sampling the genuine article in Rome, passed on from his pizzaiolo friends. Avoid dining during the busiest hours, between 8 and 10 p.m., when many restaurants ramp up the temperature of their oven to 390 C to reduce cooking time. This leaves the bottom and crust overdone and slightly black, and the tomatoes undercooked. Best to go early or late to experience the pizza as it was meant to be enjoyed.